Prescription Drug Take Back Event – Prevent Pharm Parties! Did you know that Pharm Parties actually exist? Unused prescriptions are brought to parties, dumped together on a table and randomly taken. Needless to say this is extremely dangerous and life-threatening. You can be a part of keeping our community safe and reduce potential overdose deaths! Simply gather up the unused or expired prescriptions from around your house. In fact, get all of your family members to do the same and turn them in at the Fightin’ Phils Stadium on April 29th! First 5,000 participants get free tickets to a Fightin’ Phils game! 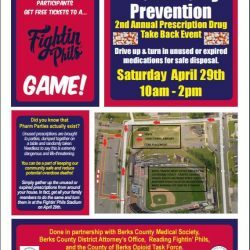 Done in partnership with Berks County Medical Society, Berks County District Attorny’s Office, Reading Fightin’ Phils, and the County of Berks Opioid Task Force. Click the image to the left to enlarge the full flyer.